Laugier-Hunziker syndrome (LHS) is an acquired, benign pigmentary skin condition involving oral cavity including lower lip in the form of brown black macules 1-5 mm in size, frequently associated with longitudinal melanonychia. There is no underlying systemic abnormality or malignant predisposition associated with LHS, and therefore the prognosis is good. Important differential diagnoses include Peutz Jeghers syndrome and Addison's disease among other causes of oral and acral pigmentation. Treatment is sought mainly for cosmetic reasons and Q-switched Nd-Yag laser/ Q-switched alexandrite therapy and cryosurgery have been tried with varying success. Laugier-Hunziker syndrome (LHS) is an idiopathic macular hyperpigmentation of skin characterized by brownish black spots on oral mucosa including lips associated with longitudinal melanonychia of nails. Extended mucocutaneous pigmentation has been seen in few cases on the neck, thorax, abdomen, dorsal and lateral aspects of the fingers, palms and soles, and the perineum. A 50-year-female presented with history of pigmented spots on lower lip, fingers, and toes which had developed gradually over last 2 years. Patient also complained of pigmentation on the tongue which had developed in last 6 months. There was no history of pain or burning sensation in oral cavity. There was no history of any drug intake (including antimalarials, minocycline or gold therapy), exposure to radiation, PUVA, or any trauma prior to the onset of the pigmentation. There was no history of precocious puberty in the patient or history of similar pigmentation in the early childhood or young age. There was no history of abdominal pain, diarrhea, vomiting, rectal bleeding, hematemesis, fatigue, hypotension or weight loss associated with the onset of pigmentation. There was no family history of similar skin disease. Clinical intra-oral examination of the oral cavity revealed moderate orodental hygiene. There were brown colored pigmented macules 1-3 mm in size on lower lip [[Figure 1]a]. Upper lip was spared. There was slate-gray pigmentation of the tongue [[Figure 1]b]. There was no pigmentation of the buccal mucosa, soft palate, hard palate, or gingiva. There was no ulceration inside the mouth. Examination of hands revealed round to oval well-defined brown-colored macules 1-5 mm in diameter on the palmar aspect of the tips of all the fingers [[Figure 1]c]. There was no darkening of the palmar creases. Similar pigmentation was seen on tips of all the toes [[Figure 1]d]. The dorsal surface of palms and soles also had few pigmented patches. The thumb nails showed longitudinal brownish black vertical bands 5-7 mm thick in size [Figure 2]. There was no periungual extension of the brown-black pigmentation. General physical and systemic examination was normal. Laboratory investigations showed a hemoglobin value of 11.2 gm%. ESR was raised to 42 mm/h. Ultrasound of abdomen was normal. A skin biopsy was taken from the macule on the left thumb, which revealed marked hyperkeratosis and acanthosis and increased amount of melanin in the basal layer of the epidermis [Figure 3]. There was no increase in the number of melanocytes and no junctional activity or melanin incontinence. The patient was advised to undergo endoscopy of the gastrointestinal tract, which came out to be normal. Patient was diagnosed as a classical case of LHS, which is a rare cause of oral and acral pigmentation. 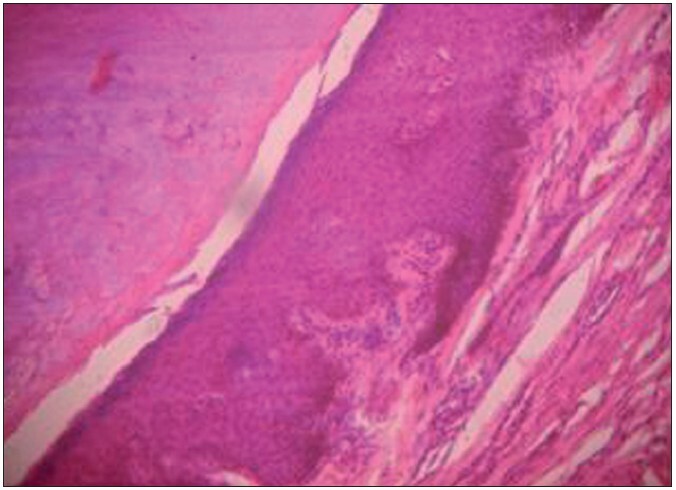 Figure 3: Biopsy of a pigmented macule reveals an increase in melanin in the basal layer of the epidermis (H and E, ×100)"
LHS was initially described in 1970 as an acquired, benign skin condition characterized by hyperpigmented macules on the lips and buccal mucosa associated with longitudinal melanonychia of nails. Considered a diagnosis of exclusion and primarily reported from European countries in white population, sporadic cases have been reported from Asia including India in last decade. ,, The pigmentation typically develops during early to middle adulthood. A mean age of 52 years and a median age of 42 years have been reported. Oral hyperpigmentation may be the only presenting sign or may coexist with skin and nail pigmentation. The buccal mucosa and the lips (usually the lower lip) are the most commonly involved sites, but gingiva, tongue, soft palate, and the hard palate can also be involved. The pigmentation is in the form of smooth-surfaced brown-, black-, or slate-colored macules measuring 1-5 mm in size. Nail pigmentation is in the form of thick vertical longitudinal bands. One or two vertical bands may appear or nails may present with half or complete nail pigmentation. 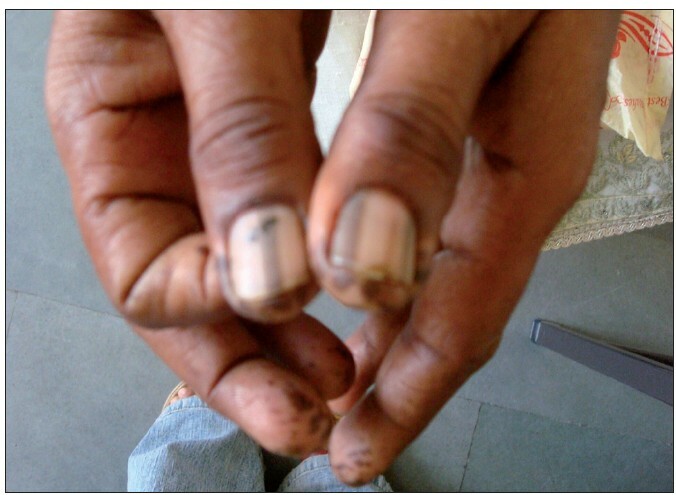 Pseudo-Hutchinsons sign when hyperpigmentation of the nail bed and matrix reflects through the transparent nailfolds simulating Hutchinson's sign, a marker of sub-ungual melanoma, has also been reported in few cases of LHS. Less common differentials of LHS include McCune-Albright syndrome More Details, LEOPARD syndrome More Details, Gardener syndrome, Cronkhite-Canada syndrome, LAMB syndrome, drug-induced hyperpigmentation, friction-induced longitudinal melanonychia of the toenails, and heavy metal exposure. Our patient had characteristic features of LHS. Patient was offered Q-switched Nd-Yag laser treatment for pigmentation, but she had no cosmetic concerns and denied treatment. Patient was reassured of the benign nature of the disease. The prognosis of the disease is good as there is no systemic illness or malignancy associated with LHS. The case is being presented for its classical presentation and to reinforce the earlier observation made by Indian authors that LHS is not restricted to any particular region of the world and to reinforce the ubiquity of Laugier-Hunziker pigmentation. 1. Koch SE, LeBoit PE, Odom RB. Laugier-Hunziker syndrome. J Am Acad Dermatol 1987;16:431-4. 2. Kanwar AJ, Kaur S, Kaur C, Thami GP. Laugier-Hunziker syndrome. J Dermatol 2001;28:54-7. 3. Ajith C, Handa S. Laugier-Hunziker pigmentation. Indian J Dermatol Venereol Leprol 2005;71:354-6. 4. Sardana K, Mishra D, Garg V. Laugier Hunziker syndrome. Indian Pediatr 2006;43:998-1000. 5. Gerbig AW, Hunziker T. Idiopathic lenticular mucocutaneous pigmentation or Laugier-Hunziker syndrome with atypical features. Arch Dermatol 1996;132:844-5. 6. Makhoul EN, Ayoub NM, Helou JF, Abadjian GA. Familial Laugier-Hunziker syndrome. J Am Acad Dermatol 2003;49:S143-5. 7. Lampe AK, Hampton PJ, Woodford-Richens K, Tomlinson I, Lawrence CM, Douglas FS. Laugier-Hunziker syndrome: An important differential diagnosis for Peutz-Jeghers syndrome. J Med Genet 2003;40:e77. 8. Shah SS, Oh CH, Coffin SE, Yan AC. Addisonian pigmentation of the oral mucosa. Cutis 2005;76:97-9. 9. Ferreira MJ, Ferreira AM, Soares AP, Rodrigues JC. Laugier-Hunziker syndrome: Case report and treatment with the Q-switched Nd-Yag laser. J Eur Acad Dermatol Venereol 1999;12:171-3. 10. Sheridan AT, Dawber RP. Laugier-Hunziker syndrome: Treatment with cryosurgery. J Eur Acad Dermatol Venereol 1999;13:146-8.